In a previous post, I reviewed Regis Stella’s Imagining the Other: Representations of the Papua New Guinean Subject and argued that it is important reading for those of us interested in PNG. In this post I reflect on its contemporary significance, offer some tips for readers, and discuss my two ‘take home’ gems from the book. Why is the book important for pretty much everyone? Contemporary portrayals of PNG and its people in international media, scholarship and by development partners reflect the persistence of the contradictions and paradoxes that Stella examines. These, he argues, reflect the biases, fears and power agendas of those who influence these representations. These typically juxtapose widely acknowledged tropes relating to development problems such as poverty, corruption, mismanagement, declining basic services, lack of capacity, pervasive gendered violence, and insecurity, with the country’s stunning landscape, untouched natural resources, and rich culture. Although things in PNG have become more complicated, tropes are still used in representations of the PNG subject. The Manus Island detention centre provides an illustration of this complexity. Vetted by the PNG government and supported and funded by the Australian government it has become difficult to disentangle indigenous actors from outsider actors in the Manus Island ‘hell-hole’ trope. Australia’s offshore detention centre on Manus Island succeeds precisely because Manus Island is represented as a ‘hell-hole’ and its people violent and unwelcoming. Sadly, for Manus Islanders, the evidence supports this representation. Ironically, within the Australian political debate, this ‘hell-hole’ trope is reinforced by both the Australian government policy to deter asylum seekers, as well as by refugee advocates to argue for the closure of the centre. Both sides of the debate in Australia speak to an Australian audience. Both rely on representing Manus Islanders as violent and the Manus landscape as a ‘hell-hole’. Unlike the historical context described by Stella, there is a PNG sovereign government that officially approves of the centre, while being almost silent on contesting the negative representation of its citizens on Manus Island. Apart from the legal proceedings initiated by asylum seekers in PNG’s courts, there does not appear to be a wider PNG national debate on the issue. These issues are worth exploring because of Stella’s argument that representation of the PNG subject and indigenous self-representations reflect contemporary power dynamics. Self-reflect: This book is powerful, unapologetically political, and has the potential to invoke deep and strong reactions. Whether you are Papua New Guinean or an outsider, a newcomer to the PNG scene or an old hand, I recommend that you read this book with an open mind and be prepared for self-reflection. To illustrate this point, I found myself reading the book reflectively and critically as I moved between the authors’ arguments and my own world view of home – PNG. As a mixed race PNG and Australian child growing up among my mother’s family in PNG, for me the ‘other’ was not PNG but rather the western world. Blessed with loving parents and a wider family who created a safe home, encouraged open debate and an interest in the country’s development agenda, I viewed white people as benevolent protectors and teachers. I had no reason to believe anything else. Remember that our points of view also evolve: Later in life my view changed as the importance of understanding the history that Stella traces became apparent to me. For example, as a researcher, my forays into archival material on PNG revealed the horrors of the violence inflicted by the colonial ‘other’ on the PNG subject. Stella’s book argues that point of view is crucial in representation and establishing power but one cannot understand this without understanding history. Debate with the author: For example, I found it an uncomfortable read mainly because of the challenges PNG faces with respect to gender-based violence. One of Stella’s arguments is that many of the tropes, such as the Manus Island example, that negatively portray PNG men are born out of fear that outsiders have. At the same time, today the international community is the strongest voice calling attention to violence against women in PNG. I could not help but refuse to dismiss the fears and anxieties of women subjected to violence. If the outside world is an important voice representing the subjugated voices of violated women and if the outcome is a negative representation of PNG men, then an important question about self-representation is: what responsibility must PNG men – especially powerful and influential men – accept in reshaping these negative representations? Think of other tropes in your line of work: For example tropes like ‘school dropout’ or ‘failures’ refer to people who have been excluded from the education system because of lack of space for them to continue in the formal education system. These labels have a lasting impact on those not fortunate enough to have further education. Considering the number of Papua New Guineans without access to schools, this is significant. These voices are subjugated when we emphasise education without acknowledging the failure of the system. Another example is the trope commonly used by politicians, elites and journalists that represent residents of urban settlements as the ‘other’ – illegal, and marginal people – in relation to mainstream society. These representations reflect fear and serve to justify calls for ‘illegal settlers’ to return to their homes. But also at stake are interests in valuable urban resources such as land. This book is full of gems and I have two favourites. Firstly, the author anticipates that future readers may ask: What about corruption? What about bad governance and bad leadership? Why does this history even matter? Stella introduces this briefly in Chapter 9 but the value of this book is in its continued applicability in the contemporary PNG context where new power dynamics within indigenous people and between them and multiple outsiders mean that issues of representation and self-representation will remain contested. These include indigenous and foreign political leaders such as elites, journalists, landowners in resource rich areas, academics, corporate companies and representatives of other states. Social media has introduced further complexity and opportunities for representation and self-representation. It has fostered a new generation of PNG writers who are challenging existing power dynamics, and enabled new exciting and important collaborations between indigenous and foreign writers. Secondly, the author’s nuanced account of history reveals a relatively unchartered space in our understandings of gender in PNG – the relational space between PNG men and outsider men. This point is important because although Regis Stella is a Papua New Guinean man, methodologically he does not position himself as such in the book. No doubt he would have experienced first-hand some of the dynamics he describes. 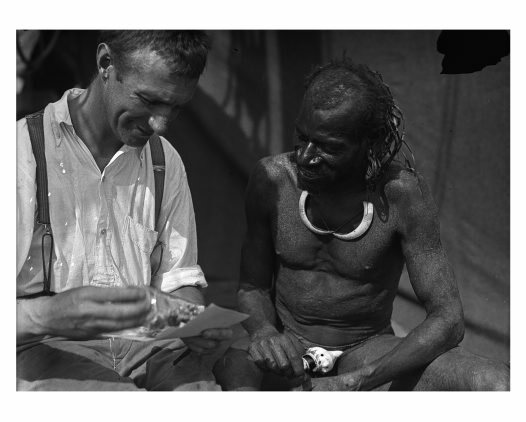 In this sense, the book is itself a brilliant paradox of representation in that by backgrounding himself while he interrogates text written by white male colonial actors, he has succeeded in shifting his gaze – and my gaze – onto the ‘other’, who is the white man being examined by the PNG man and not vice versa. I could not help feel that Stella had deliberately but very gently deployed the strategies used by indigenous writers in self-representation that he examines in the book (compartmentalisation, appropriation and interpolation). The book has contemporary relevance and applicability in the more multicultural and multiracial country that PNG is today. It is not overly theoretical and is a relatively easy read, yet offers a complex and nuanced analysis. For anyone who wants to better understand PNG, it is essential reading.